In one of the more convoluted scenarios of Norman's tenure, a rift in space-time created by Tyler Stone (Alchemax executive and resident of the year 2099) caused the Dark Avengers to battle a strange array of monsters (albeit briefly). 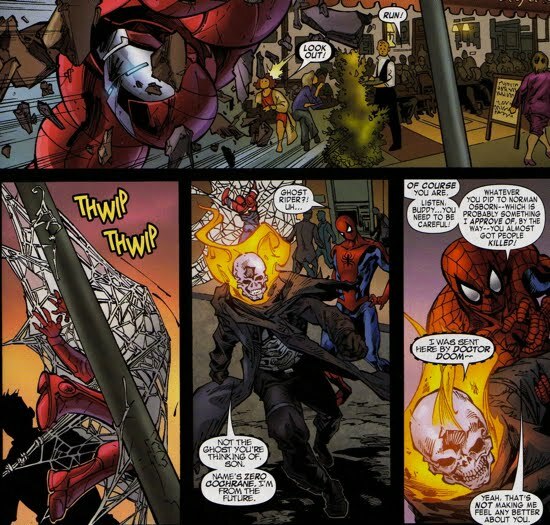 Norman's role in this 'timestorm' was also very brief and it involved a confrontation with the Ghost Rider from 2099 (aka Zero Cochrane) in Washington D.C. After Zero overrode Norman's 'primitive' Iron Patriot armor, he forced Osborn to take him to New York City, which was a location given to Zero by Dr. Doom (as a part of solving this whole 'timestorm' dilemma). Once Zero reached NYC, he ditched Osborn (and his armor) leaving the Iron Patriot deactivated. This incident can get filed under 'someone getting the best of Norman Osborn', but the stakes were not that high. Norman wasn't injured and he eventually returned to D.C. to join the rest of the Dark Avengers in order to clean up the mess caused by the 'timestorm'. 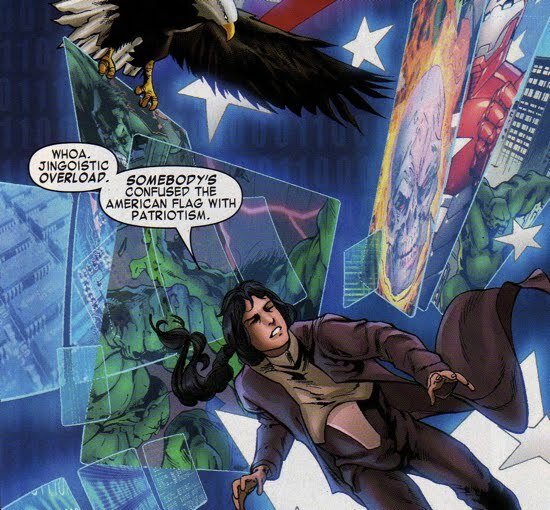 Once Zero made his way inside the Iron Patriot software he makes a pretty astute political observation...jingoistic? I actually had to look that one up, 'extreme patriotism in the form of aggressive foreign policy'...rather appropriate.